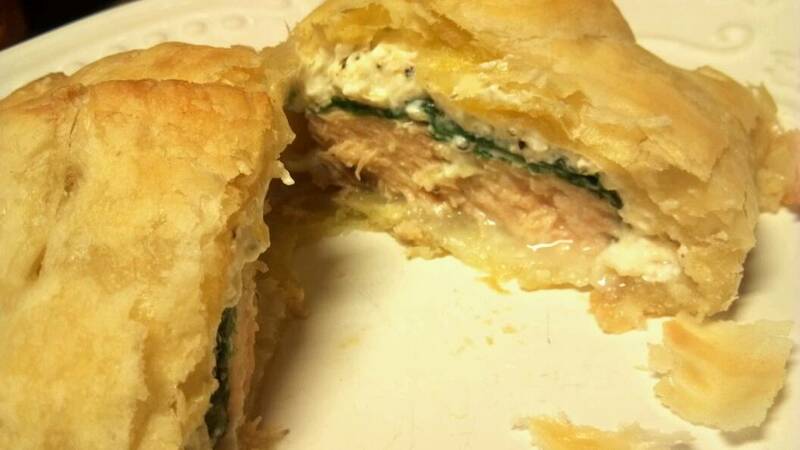 If you LIKE this recipe, please share it or Pin or Repin this Salmon Wellington Recipe on Pinterest. In addition to being frugal I want to introduce new dinner options to my family, especially fish since it is good for you. That said I also don’t like to spend hours in the kitchen! 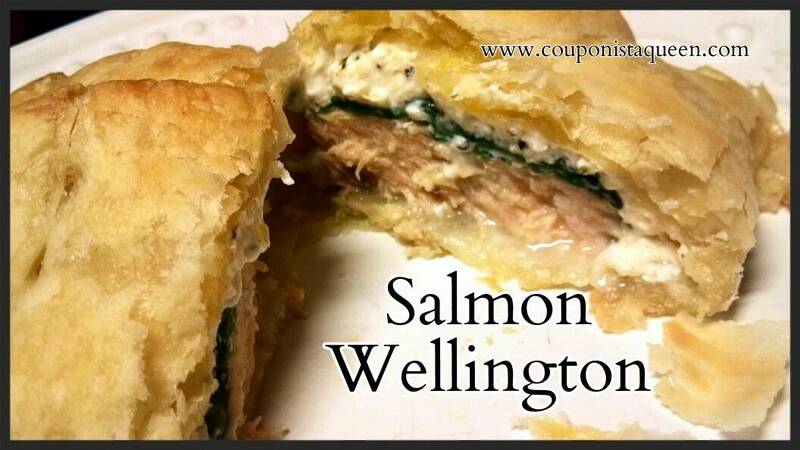 My husband and I love seafood so I started to research Salmon Wellington. I found a few recipes and then I changed them a bit to work for what I had in my pantry and what we’d like. 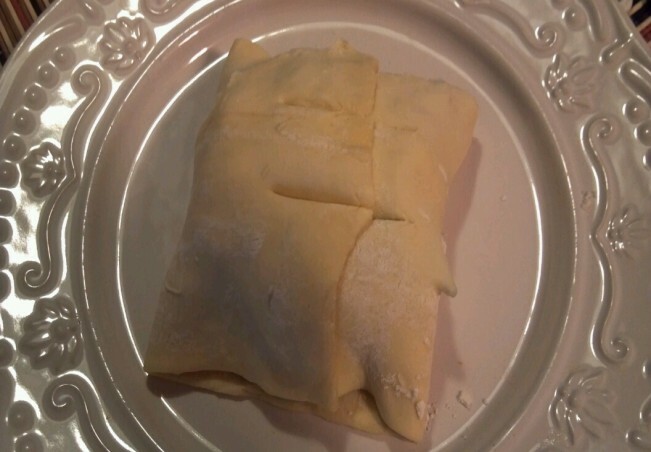 Thaw the puff pastry sheet according to directions on the package. Once thawed, cut in half. 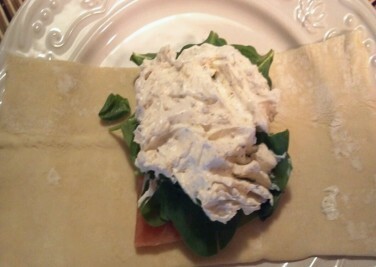 Open half of the pastry sheet and place salmon fillet in middle. 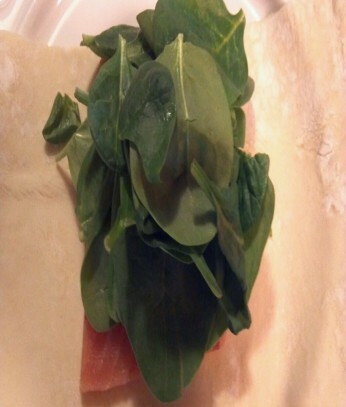 Top salmon with spinach leaves, generously. 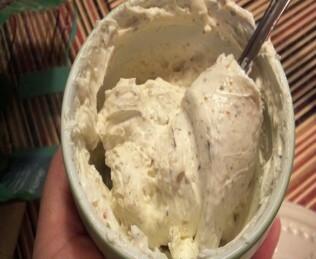 Mix cream cheese with garlic herb seasoning. 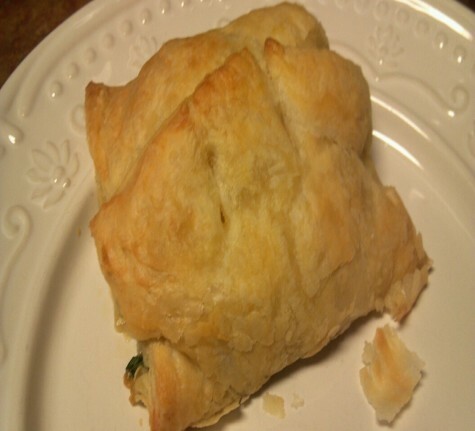 Top the spinach with the cream cheese mixture and then fold the pastry over to close. Different recipes have different ideas for the seasoning, some use Lemon Pepper instead of the Garlic Herb, some also use Pesto so its really up to you. I had the Garlic Herb and Pesto but opted for the Garlic this time. I have to wonder if the Philadelphia Cooking Creams would also work well on these since they have the Italian, Pesto and Garlic blends. I like that idea since you can score good deals on those with coupons, definately worth trying next time. Recipes I found also use a thawed out package of frozen spinach, with all the water removed. I make daily green smoothies so I have fresh spinach on hand. I’d also imagine you can use canned but it just depends on what you have and what tastes better for you. I did find that not all supermakets carry the pastry sheets. I found mine at Walmart but I also found if you have the refrigerated Crecent Rolls some have substitued those for the pastry sheets. 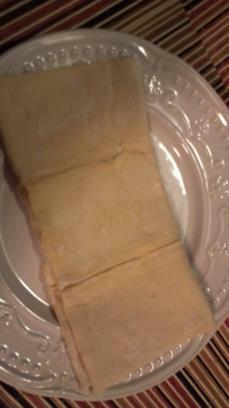 They roll them out and thin it out some to make it resemble a pastry sheet. I like that idea if you have trouble finding the pastry sheets and they are cheaper as you can always score a deal on those with coupons so definately something to experiment with in the future. Back to my Salmon, after you put together, make two slits on top and let it sit in the refrigerator for 30 min. The actualy putting of the salmon packets together took 15 min or less, easy peasy. Bake at 375 for 20-25 or until a nice golden brown color. My husband gave it 2 happy thumbs up!